This vibrant return address label selection allows you to finish off outgoing mail with a colorful, personal touch. It features a contemporary polka-dot design in orange and white. The pattern uses an eye-catching perspective and reverse-imagery to create a look that is simultaneously straightforward and original. But it's not just about appearances. You'll love how much easier it is to fill out letters and packages before sticking them in the mailbox. That's because these are self-adhesive labels. Just stick them in place and turn a tedious task into a pleasurable experience! 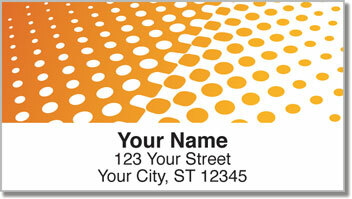 Order your own Orange Halftone Address Labels from CheckAdvantage today! You'll also find other color options as well as matching personal checks.